There isn’t only the outdoor jungle, there’s also the urban jungle, isn’t that so? Let’s talk about an accessory we’re very fond of, this time in the urban setting. Did it happen to you to develop a passion for a particular clothing item, only to realize soon after that that article is everywhere around you? important collections for the current season. I don’t necessarily associate it with hipsters alone; I saw business people who dropped their suitcase in favor of the backpack, and young men who wear one just for the sake of utility. Eventually, every day is an adventure in the urban jungle, isn’t it? So, let’s see why wear them, and what are some cool backpacks for men this year. 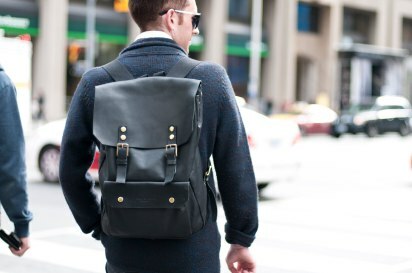 The backpack is an ultra-masculine accessory. That’s if you grin if I suggested you a handbag. This season there are a lot of variations, so you’re sure to find one that fits your style. In general backpacks have much more affordable prices than bags. You can take it with you and go skiing, or travel. If your shoulder hurts from that bag that you carry day in-day out, you should replace it with a backpack even if just for medical reasons. An urban man shouldn’t turn a deaf ear to reason simply on grounds of style. There is a backpack for any style. Most modern clothing guidelines prohibit matching a backpack to a business outfit, either because it does not send a formal enough message, or the straps wear out a jacket’s shoulders. I find the backpack a very inspired choice, but there are a few rules to keep in mind in order to wear it with a suit. Choose a backpack with a slightly squarish shape, from a quality material (leather or cloth), rigid, in a neutral hue (black, dark brown, dark blue). Make sure it’s got a leather handle so you can carry it in hand, like a bag. Avoid models with too many zippers, fasteners, belts or other accessories! When it comes to men’s cool, Kanye is a guy of reference. Urban, with a relaxed attitude, experimentalist when it comes to clothes and unpredictable style, Kanye always wearing the most expensive creations, often long before they appear in stores. If you like his style and want to complete your outfit with a cool backpack, choose one with a creative design, or an extravagant print. Choose a statement piece! My favorites are my backpack with camouflage print, from Valentino, the backpack that can be worn as a handbag from Kris van Assche, and the cow leather backpack, from Dries Van Noten. A backpack suitable for the gym or jogging in the Park, or for riding the bicycle must be easily adjustable, sturdy, of little weight, and made of a waterproof material. The brands that produce sports equipment carry a wide range of backpacks suitable for your recreational activities. Even if you buy one more for its usefulness, do not ignore the way your sports backpack looks. Find a modern backpack in a hue that matches your equipment. Keep in mind that there are a few very fashionable lines of sports equipment as well! For a weekend with friends, a short vacation in the mountains (or at the seaside) or a hiking trip around the country, all you need is nothing other than a sturdy backpack, roomy and well divided, so that you can take along some comfortable clothes and your daily hygiene kit. The weekend backpack is a much more useful and convenient alternative than a 48h travel bag and, although it doesn’t seem quite as roomy, you know that the secret of space lies in the outer pockets and the well thought-out compartments in which you can cram as many things as you like. If you choose a backpack according to your style – of leather or cloth – and wear it with the right attitude, you won’t look like a school boy on a school trip. I love Marni, a backpack with red leather details, but also the H&M Mauritz Archive collection.